TUESDAY, APRIL 23 — Our first full day in Dublin was winding down. After dinner and beers at a couple of pubs in the Temple Bar district, we headed back to our hotel. But before calling it a night, we went to The Barge for a nightcap. How I Heard About It: The Barge was right across the street from the Hilton Dublin in a beautiful building on the Grand Canal. The cab driver from the airport pointed it out to us when he dropped us off at our hotel. He highly recommended it, so we couldn’t wait to check it out. Beers Sampled: I love Guinness. But I wanted to explore the Irish beer scene a bit before I had any Guinness. I had my fill of local craft brew earlier that day at Porterhouse and Farrington’s, so it was time for my first pint of Guinness. It was the perfect ending to our first day in Dublin. The Barge was very convenient to our hotel, but that’s not the only reason we went back several times over the five days we were in Dublin. The interior was huge and fun to explore – there were three levels, with a bar on each level. And the service was outstanding! On our first visit to the Barge, we kept to the small bar on the first level where we found the standard beer line-up – Guinness, Smithwick’s, Carlsberg, Heineken and the like. When we went back two days later it was late afternoon, but not quite happy hour, so it was quiet. We decided to venture off the first level to explore the place. 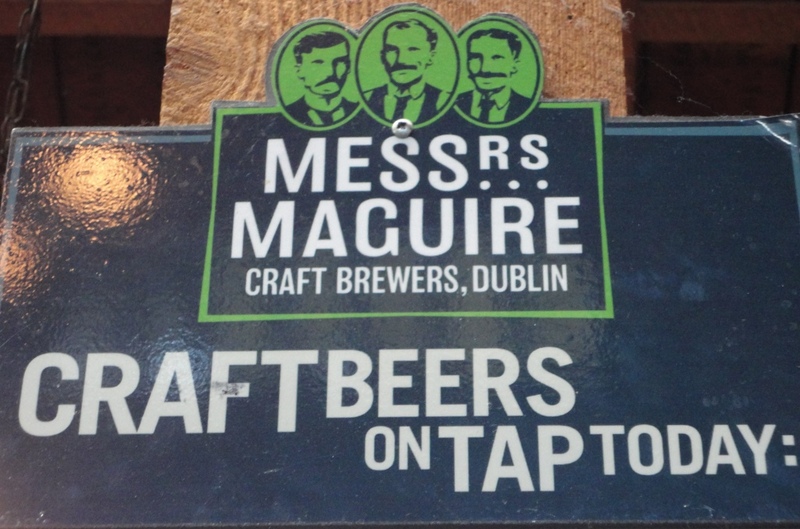 On the second level I struck gold – taps of Messrs Maguire, a Dublin craft brewer. 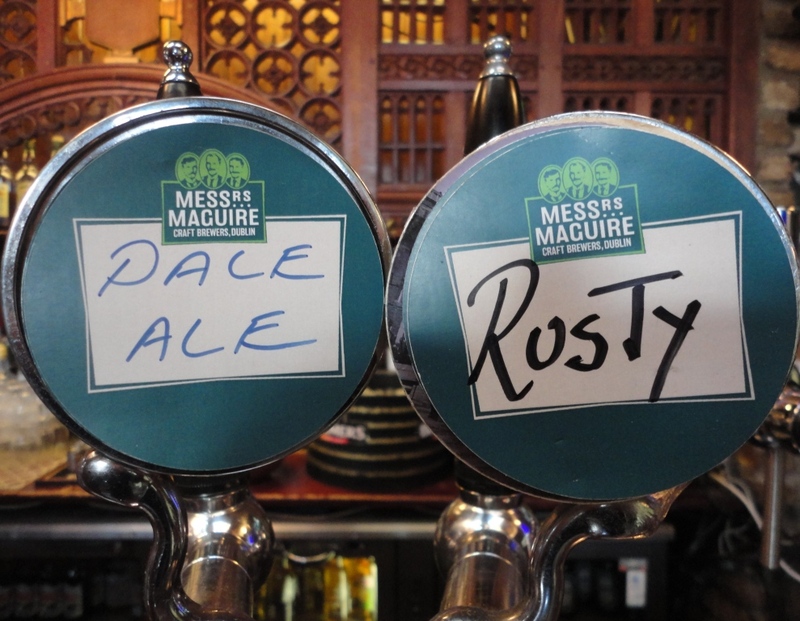 I enjoyed a Messrs Maguire Pale Ale and Rusty as we watched the place being set-up for a huge Heineken Cup promotional event later that evening. 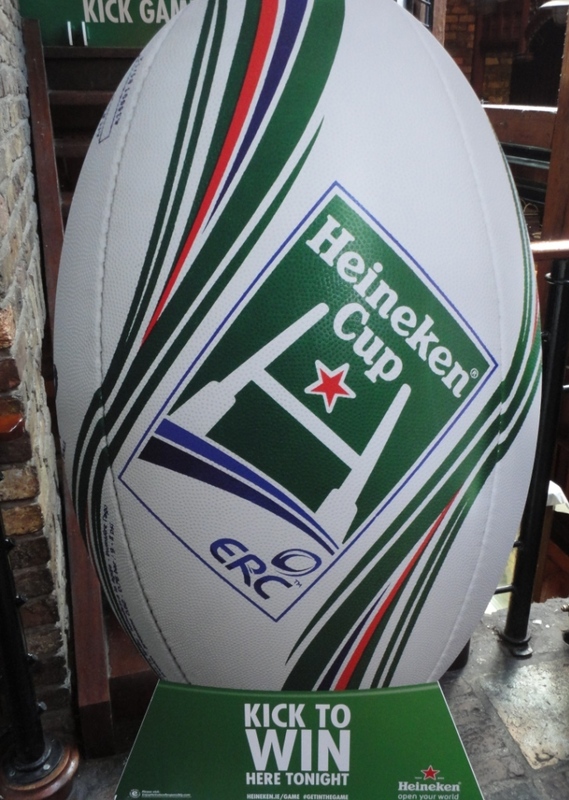 I wanted to stay and try the interactive rugby kicking game, but we had other plans for dinner.